Demolition crews are shown tearing down the former Armintrout law office building on Governor Trimble Place in Hillsboro on Thursday. 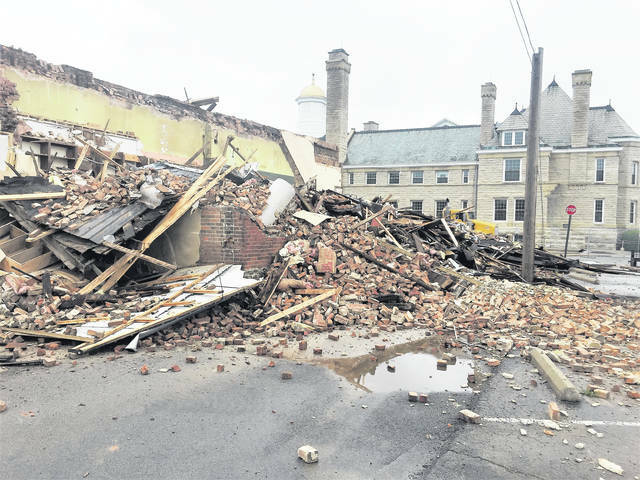 By mid-afternoon Thursday, the former Armintrout building had been reduced to a pile of rubble, which will be hauled away beginning Friday. 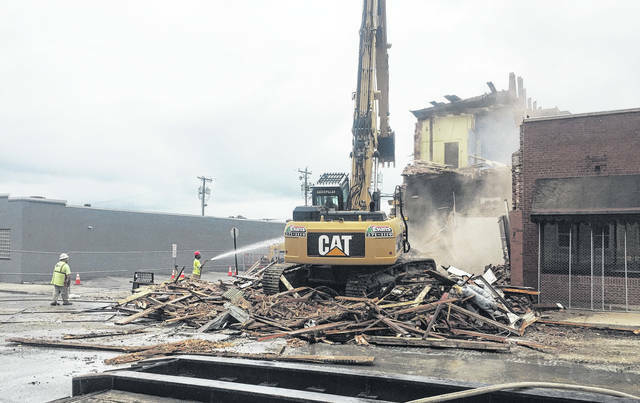 A demolition crew from The Evans Group tore down the former Armintrout law office on Governor Trimble Place Thursday. Crew leader Dave McLaughlin said Thursday morning that the building would be completely demolished by the end of the day, and removal of debris would commence soon. By mid-afternoon, the structure had been essentially demolished into a pile of rubble. The building is owned by Hillsboro Mayor Drew Hastings, and it’s being torn down as part of the city’s demolition assistance program, with the city fronting the roughly $30,000 cost, to be repaid by Hastings over five years of assessments on his property taxes. McLaughlin himself skillfully operated the giant demolition crane used to bring down the building, carefully maneuvering the bucket to grab specific boards and beams, tearing off pieces at a time. Employees inside the adjoining Times-Gazette building were cautioned to stay clear of the interior wall that abutted the Armintrout building, but no discernable damage was done to either the interior or exterior walls of the newspaper office. Hastings plans to use the space to create private parking for tenants, including The Times-Gazette, of the old city building, which he purchased in 2009 and remodeled into modern office space. He purchased the Armintrout building last year from John “Buck” Wilkin after a proposal fell through for the city to purchase the building for demolition and public parking in conjunction with the creation of a plaza that would have covered what is now Governor Trimble Place. The city is proceeding instead with the creation of a smaller “green space” area on the north side of Trimble that will include grass, benches, new pavers and new lighting. A new decorative clock has already been placed. Work will resume on the small park once debris from the demolition project is removed. The green space will stretch from the corner of Trimble at North High Street past The Times-Gazette to the alley next to the Eagles parking lot. The plan is to turn Governor Foraker and Governor Trimble Place into one-way streets, with traffic flowing from West Main and exiting onto North High. https://www.timesgazette.com/wp-content/uploads/sites/33/2018/06/web1_demo-2.jpgDemolition crews are shown tearing down the former Armintrout law office building on Governor Trimble Place in Hillsboro on Thursday. https://www.timesgazette.com/wp-content/uploads/sites/33/2018/06/web1_demo-three.jpgBy mid-afternoon Thursday, the former Armintrout building had been reduced to a pile of rubble, which will be hauled away beginning Friday.